With the November 2014 election rapidly approaching, you may have seen a recent advertisement in the Taylor Press newspaper soliciting votes for the passage of a tax in the amount of $.02 per $100 property appraisal value for maintenance and upkeep of the rural floodwater retarding dams on Lower Brushy Creek. There was also a notice of an October 21, 2014 public meeting in Coupland concerning the same subject. In nut shell: These dams were originally funded and built some 50+ years ago by the USDA’s Soil Conservation Service (now, the Natural Resources Conservation Service (NRCS)) with the alleged stipulation that local funds would be secured for the upkeep of the dams. A few years ago, this maintenance and upkeep tax issue came up for a vote among all those in the Brushy Creek watershed. Real estate developers in the upper reaches of Brushy Creek built houses below some of these rural dams and, with concern over liability in the event of a dam failure, they pushed to have the dams upgraded and have the taxpayers along all of Brushy Creek pay for it (i.e., bail them out). The taxpayers in the lower part of that watershed said no and the Lower Brushy Creek Water Control & Improvement District (WCID) was formed as a consequence. The solicitation advertisement is misleading on several counts: It’s subtitle is “our rural dams are old and out of shape” and shows a photo of what appears to be a much smaller breached dam in a California desert-like landscape setting — certainly not southeast Williamson County. The dams were funded and constructed by the USDA; however, the implication of the advertisement is that they were built with non-taxpayer funds. Wonder where the USDA got its funding if not from the US taxpayer (you and me). These dams may be 50+ years old but not one of them has ever been breached and most have not even had water flow over their emergency spillway. WCID states that its dams require $6.8M for maintenance and upgrade and that the WCID has secured $6.5M in Federal and State funds, needing only a small amount of local money to round out the cost. Actually, it turns out that receiving the $6.5M is contingent upon having the missing $300K made up from local “matching” funds. Hence, they haven’t secured any funding, they just have a pledge that if WCID comes up with about 4% of the “needed” $6.8M, then they’ll have access to the $6.5M — bit of a shell game. And for a lot of taxpayers, the claim that the tax will only amount to a “pizza a year” is also a grossly misleading statement. That figure came from the city of Taylor’s current average home appraisal of around $100K. That is an average, which means for many the tax will be much higher. Of more local Coupland interest is Flood Retarding Site No. 32 (Dam #32), just southeast of the town. As mentioned, the USDA built this “conservation” dam and, although there were no additional property taxes levied at the time the dam was built, now the WCID wants to start taxing us because of its and its predecessors’ 5 decades of failure to plan. To be fair, in the competition for scarce public funds, these dams were no doubt a low priority and dirt dams don’t need that much maintenance anyway. 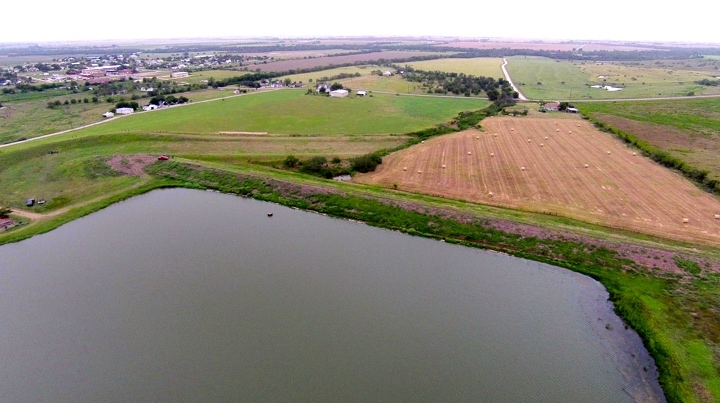 For instance, according to the NRCS’s current evaluation, Dam #32 is still structurally very sound, the surrounding riparian area is in excellent condition, the impoundment has the capacity for an additional 70+ years of silt accumulation, and the dam is fully functioning exactly as designed. There is nothing organically wrong with Dam #32 or its operation. Recall that the purpose behind the dams WAS NOT water storage or recreation but to act as big retaining ponds to slow the water flow down thereby reducing the magnitude of Brushy Creek flooding from heavy rainfall events. Which brings us to the point of why Dam #32 is rated “high risk”, one of three such rated dams out of the 20 plus dams in the WCID, and why the dam is considered to not meet current “high risk standards”. Dam #32 is considered high risk solely because of a single residence below the dam. And it doesn’t meet high risk standards because in 1960 it was built to meet the then existing standard, not today’s standard that mandates the dam withstand a localized catastrophic event of 30 inches of rain in 6 hours. Yes, the home below the dam is at risk and the potential for loss of human life is horrific and should be avoided but the dam was in plain sight when the home was bought by the current owners (in fact, the dam predates the original establishment of the home site by several of years, i.e., the dam was there long before the house) and if Coupland were to get an unlikely localized 30 inches of rain in 6 hours, the major local flooding would not come from the dam’s roughly 700 acre catchment basin, but from the seasonal creek that originates at the Travis County line and collects ten times that amount of water — which you may have seen in flood as it’s the first creek crossing FM 1466 going east out of Coupland. Assuming one accepts WCID’s rationale and proposal that Dam #32 must be upgraded, their cost estimate to do that is $1.2M, of which $925K would come from Federal and State funds and the other $300K locally raised. Well, that sounds simple enough, WCID raises $300K through a watershed-wide property tax and nets the total $6.5M windfall discussed above, thereby getting the $925K of other taxpayer money to help pay for Dam #32’s upgrade. But wait a minute, the WCID estimates its area wide tax base to be roughly $1.5B, making an annual tax revenue in the neighborhood of $300K. It is claimed that the total maintenance backlog for the remaining dams is in the range of $800K-$900K with no comment on the disposition of whatever remains of the $6.8M. The WCID offers another alternative which is to intentionally breach Dam #32 (bulldoze a cut through the dam and leave the remaining dam structure standing) and allow the water from the 700 acre catchment basin to flow unretarded. The cost of that, with associated work, is estimated at $326K. The WCID has not given any indication on how the annual $300K tax revenue would be prioritized and budgeted, making one think that the Dam #32 issue is just a hook to establish an unending $300K tax revenue stream. So, let’s look at the $300K in a slightly different light. For example, an authenticated and URL verifiable listing of just 12 annual Federal expenditures of questionable merit totals $338.3B — to keep it simple, let’s round down to $338B. As such then, the $300K raised in new annual property taxes equates to 0.00009% (just 9 one hundred thousandths of 1 per cent) of what has been squandered on various welfare programs, illegal alien support, etc. And what does that $338B annual expenditure buy us? Nothing, other than the establishment of a permanent (and growing) welfare class. The USDA has funded 11,800 such “flood control” dams in 47 states since 1948. These dams were all built with a 50 year “design life”. That doesn’t mean they “die” at 50 years but that was the number of years for which they were “warranted”. If these dams are still meeting their designed function, there is no reason their “lifespan” can’t be extended without a lot of rehab. In the 2014 Farm Bill, the USDA programmed $262M to rehab 151 dams/watersheds in 26 states. The USDA estimates the annual benefit of these dams at $2.2B (many untested assumptions go into making up this number). The Texas share of this $262M is $33.8M spread over 31 dams/watersheds. This is where $601K of the $925 “other eligible funds” discussed above for Dam #32 originates, the remaining $324K coming from state funds. I say: the USDA built ’em, let the USDA figure out how to fund their upkeep with additional “free” Federal “infrastructure” dollars as a “shovel-ready” enterprise — put more of our income tax dollars to work here at home, we already contribute enough through our property taxes! In the sprite of full disclosure, for the “high risk” dam located here at Coupland, I own the vast majority of the acreage that is immediately “at risk” should the dam be breached and neither I nor the homeowner directly below the dam were ever consulted with nor informed about any downstream impacts of such a hypothetical catastrophe until the WCID’s October 21 public input meeting. So, short of preventing the loss of a human life, I have the most at stake but I say NO to the proposal for the $.02/$100 valuation tax — a penny here and a penny there and pretty soon there is no blood left in the turnip. Neighbors or not, I do not believe the Lower Brushy Creek Watershed Board of Directors have built a supportable case for their tax request. This entry was posted in Government Policy, Local Government, Opinion & Commentary, Politics & Elections, What's New? and tagged dam maintenance tax, Lower Brush Creek WCID, Max Marasco, special election on October 28, 2014 by Stewart Dale Spencer. Does anyone know if public can go Fishing there? No, it’s on private land, as are many of the dams.